13 Above: Google Earth Reveals Ancient 1,000 Years Old Fish Trap !! Google Earth Reveals Ancient 1,000 Years Old Fish Trap !! For a millennium it has lain undisturbed beneath the waves a stone's throw from one of Britain's best-loved beaches. But now modern technology has revealed this ancient fish trap, used at the time of the Norman Conquest. 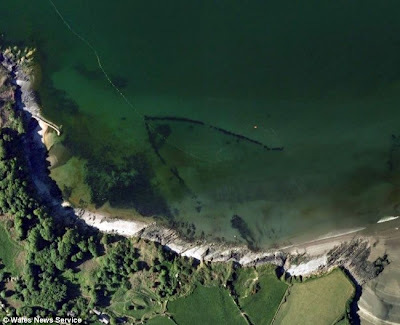 In Photo : The giant fish trap, built during the Norman Conquest and designed to trap fish behind rock walls, was spotted on Google Earth. Stretching more than 280 yards along the sea bed, the V-shaped structure was used to catch fish without the need for a boat or rod. Scientists believe it is one of the biggest of its kind. 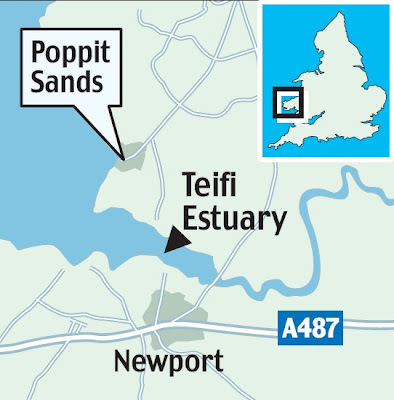 The trap close to Poppit Sands on the Teifi Estuary in Dyfed was discovered by archaeologists studying aerial photographs of the West Wales coast. In Photo : This image shows the coastline curving round with the trap visible out at sea. It is in water just 12ft deep, and the wall is around three feet wide. It was designed to act like a rock pool, trapping fish behind its stone walls as the tide flowed out. At its point is a gap where fisherman would have placed nets to catch fish. They could also have blocked up the gap, and then scooped up fish trapped in the shallows. Now, however, it is submerged even at low tide and fish are no longer trapped as the water recedes. Researchers believe it has sunk into the sand over the centuries. 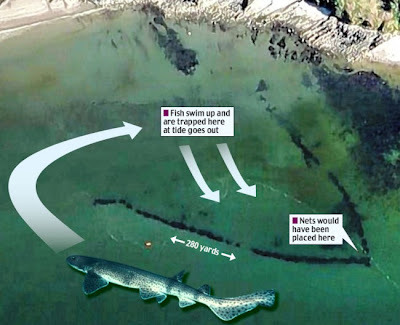 Dr Ziggy Otto, a diver and lecturer in the coastal environment at Pembrokeshire College, believes the trap is around 1,000 years old. In Photo : The trap, made of stones, is located on the Teifi Estuary in Dyfed, Wales. Although it was only recently spotted on aerial photographs, an armchair archaeologist could have discovered the trap on Google Earth. Google said the V-shaped structure has been visible on its collection of satellite and aerial photos since at least December 2006. Fish traps, or fish weirs, were common and controversial in Britain 1,000 years ago. They were so effective at removing fish from rivers that they were banned in the Magna Carta, and were allowed only on the coast.